Looking for an amazing magician for your wedding, party or corporate event in York? then look no further than close up magician Martin Waring. Martin has a warm style which blends in perfectly with any event from a wedding party, a house party or a corporate event and has been astounding and entertaining guests in York since 2003. The York Hilton, The Marriott Hotel, The Monk Bar Hotel, The Cedar Court Grand Hotel, Hazlewood Castle, The Pavilion Hotel, Churchills Hotel, Burn Hall, Aldwark Manor, The Hospitium, The Merchant Adventurer's Hall, Sandburn Hall, York Racecourse, The National Railway Museum, Chiquitos, Fairfield Manor, Biltmore Bar, Rowley Manor, Barley Hall, The Parsonage at Escrick, St William's College, Solberge Hall, Middlethorpe Hall, The Grange Hotel, The Morritt Country House Hotel, Hotel du Vin, York's Chocolate Story, The Golden Lion in Northallerton, Kellington Manor Hotel, The Wensleydale Creamery, The Crown Hotel Harrogate, The Palm Court Hotel, Scarborough, The Alice Hawthorne gastro pub, The Holiday Inn York, Rotherham Golf Club, Crewe Hall Hotel, Woodhill Hall, Otterburn plus numerous private houses, marquees, village halls, various old people's homes, Driffield Showground, The Great Big Welly Fest, an RAF base and an Army base. « I can't express just how fantastic Martin was. All of our guests were wowed and amazed and even the children throughly got involved in the magic! Martin was the absolute professional even when the kids almost ruined the magic! I knew when I booked Martin that he was good, I had seen some videos but I wasn't prepared for how genuinely nice he is and how much he made our day better for being there! Magic has been a passion of mine since 2003 when I first discovered a magic stall in York market. I bought a few tricks and started practising them on friends and family. A couple that I got to know on a trip to Ghana in 2004 then invited me to perform a stand-up show at their wedding. The reactions I got, to my then amateurish performance, were sensational and I realised that I had the potential to develop this new found hobby into something much more professional. Since then I have performed at a range of events including parties, weddings, formal dinners, trade shows, a hunt ball, christenings and festivals, mainly but not exclusively in North Yorkshire. My preferred style is to do close-up magic at tables making things disappear and reappear in unusual places, often the magic happens right in your guests' own hands. I work with mostly cards, coins, borrowed rings, strings, borrowed phones and some more unusual items. I also love to perform mentalist type effects but my aim is not to prove anything, merely to entertain people. If people tell me that they've had fun and they often do, then I know I've achieved what I've set out to do. My sole aim is to bring fun to any event. If you are having fun then so am I.
I'm constantly searching for better and better ways to entertain you. This involves researching new effects but also improving my performance of old effects. Magic is 80% presentation and 20% mechanics so presentation is key. 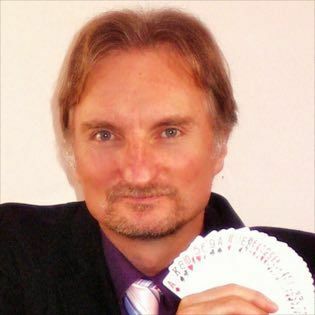 I bring my passion and interest in magic to your event for you to enjoy. People often comment that I let my passion shine through which is just how it should be. Magic should be like that sense of wonderment that you first experienced as a small child. If I can create that for you then I've achieved what I'm aiming for.